SAVING CHRISTMAS AND STOMPING OUT EVIL – PART 2 OF OUR CHRISTMAS GIFT TO YOU!!! The celebratin’ is in high gear in THE DARK VAULT OF PUBLIC DOMAIN. So make this yet another Christmas season to remember by joining UNCLE PETE and his trusty sidekick OXNARD for the second half of our annual Christmas tradition this Saturday night with the 1959 classic – SANTA CLAUS. Made entirely in Mexico (where else would you make a movie about Santa Claus), this cinematic gem reveals some of the previously unknown secrets of Santa’s operation at the North Pole and how he manages to complete his annual trip, visiting the homes of all the world’s children. But the devil wants to put a stop to all this Christmas joy and he sends Pitch, one of his henchmen, to try to foul up things for Santa and all the good boys and girls. It’s a classic battle of good versus evil with some science, a little magic and a good dose of fun in UNCLE PETE’s favorite Santa Claus movie. 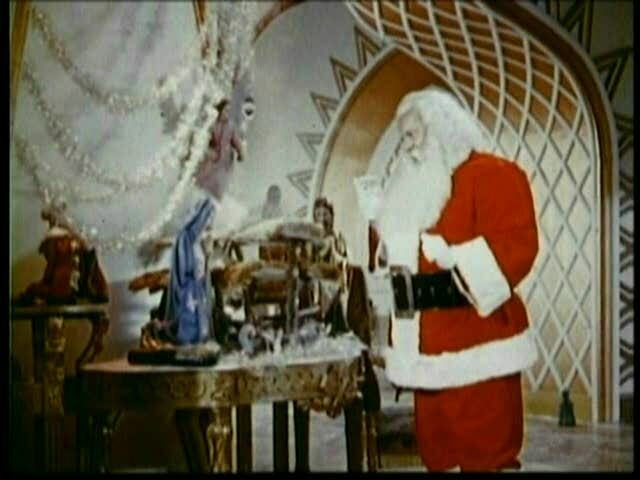 Made in 1959 (a good year) and released in the U.S.A. a few years later, it’s SANTA CLAUS. Meanwhile, UNCLE PETE and OXNARD are completing some experiments and observing a few DARK VAULT Christmas traditions at a remote research facility. Then it’s back to the DARK VAULT for the annual Boiler Room Christmas Party. Except, the research facility is so remote that UNCLE PETE isn’t sure how to get back there. So it’s up to the miraculous, infallible sniffer of the mighty OXNARD to lead them home and to the party. Along the way, UNCLE PETE digs up the first Rudolph The Red-Nosed Reindeer cartoon, some slick singing sisters with a little Winter Wonderland, a Christmas short with Paul Winchell and Jerry Mahoney and several other Christmas shorts and great toy commercials (including one for Gaylord, the niftiest mechanical hound dog ever!). There’s even some vintage footage of UNCLE PETE’s family (including his Mom, Dad, and brother) whooping it up in a Christmas of long ago . So join UNCLE PETE and his best friend OXNARD (in what has become her farewell appearance in a DARK VAULT episode) this Saturday night, December 20, 2014 from 10PM to midnight on Binghamton’s channel 4, Sayre, PA’s channel 17, and Elmira/Hornell/Corning’s channel 99. It’s THE DARK VAULT CHRISTMAS SPECIAL – II, featuring SANTA CLAUS! Make sure your chores are done and line up plenty of Christmas goodies. It’ll be one for the books and one to remember, and it’s the second half of our special gift to you from UNCLE PETE and OXNARD and everyone in THE DARK VAULT OF PUBLIC DOMAIN!!! ~ by UNCLE PETE on December 19, 2014. Uncle Pete and Oxnard: How do I see the show from Rhode Island? is there a website you post to? Youtube? I’d love to see Jerry Mahoney and the Rudolph cartoon and everything…sounds absolutely wonderful. Please help! Thanks! Oxnard and I have always had a lot of fun making these episodes, especially the Christmas Special. We have some shows that are on youtube somewhere along with a bunch of promos for various shows. A search for Dark Vault Of Public Domain or Uncle Pete should turn up most or all of them. Do you have a local public access channel? We’d love to see about sending you a bunch of the shows so maybe they could air on TV in your town too! I’ll be in touch.